Background: Endometrial cytopathology is a powerful tool for the detection of a wide variety of benign lesions,atypias, inflammatory changes and infectious organisms. It is also helpful for the cyto-hormonal evaluation of patients and the detection of endometrial malignancies. Aim:To assess the adequacy of the aspirated endometrial sample and identify the morphological parameters with regard to making a definite diagnosis. 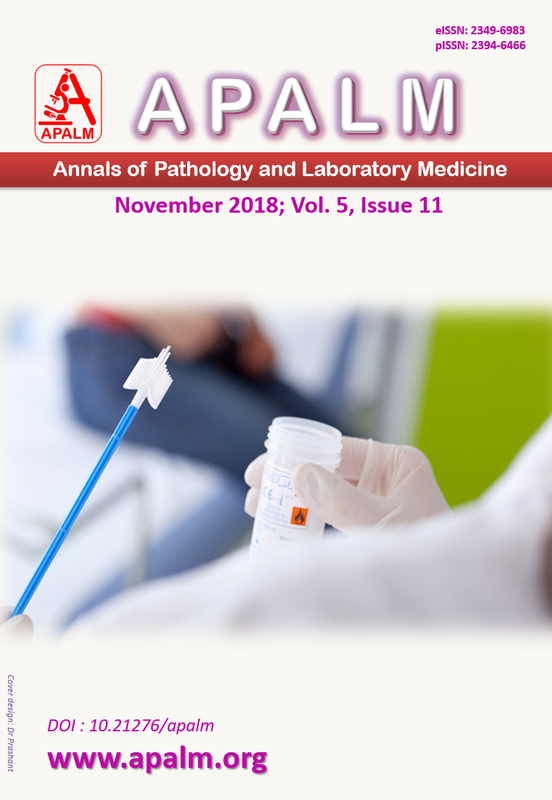 The aim of this study is to analyse the accuracy of endometrial aspiration cytology diagnosis in comparison with histopathological correlation. Methods: Endometrial aspiration using a Karman’s cannula was done in 58 patients who presented with abnormal uterine bleeding to the department of Obstetrics and Gynecology during the period of July 2013 to Jan 2015. The cytology smears were stained with Papanicolaou stain and May- Grunwald- Gimesastain. Following aspiration Dilatation and Curettage was done for all cases. The formalin fixed tissue samples of curettage were stained with Hematoxylin and eosin staining for obtaining the histopathological diagnosis. The statistical analysis was performed using EPI info version 3.5.3. Chi square test was used to correlate the parameters. Result: : In the present study endometrial aspiration cytology and histopathological correlation were performed on 58 cases. The patterns identified on EAC were 27 cases of benign endometrium (46.6%), 24 cases of simple hyperplasia(41.4%) , 4 cases of endometritis(6.8%),1 atypical hyperplasia (1.7%) and 2 cases of malignancies (3.4%). Secretory phase endometrium was the most common benign lesion amounting to 36.2% . Conclusion: Endometrial aspiration cytology was found to be a safe outpatient procedure in the diagnosis of cyclic changes and endometrial lesions.The accuracy of identifying benign, inflammatory and malignant lesions was 98.28% to 100% making EAC an effective procedure. 1. Juan R. Rosai&Ackerman Surgical pathology 10th ed. New Delhi: Elseiver; 2004:p1477-1500. Curettage - endometrial cytology. Br Med J 1984; 288: 981-983.
uterine bleeding. Indian J Pathol Microbiol 2006; 49(2):214-217. 5. Dharan M. Utility of cell block preparation in endometrial aspiration cytology: A report of 4 cases. Acta Cytol 2010 Sep-Oct;54(5 Suppl):893-7.
years and older. Assessing the clinical usefulness of Bethesda 2001. Am J Clin Pathol. bleeding. Am J Obstet Gynecol 1978;131(4) :410-415.
curettage. Acta Obstet Gynecol Scand 1988; 67(4):343-5. Advanced Researches in Biological Sciences 2013; 5(4):366-69.
bleeding. J Cytol 2014; 31(3):144-8.
with DUB. People’s journal of scientific research. July 2012.5(2):13-16. 13. Koss LG, Melamed MR. Koss diagnostic cytology & its histopathologic basis 5th ed. Histopathology. Husain OA, editor. New York: McGraw Hill; 1992. pp. 26–161. sampler with cytohistologic correlation. Acta Cytol 1979; 23:303–8. cancer and its precursors. Acta cytol 1979; 23: 353-359.
jet washing. Its possible use for and early diagnosis. Gynecol oncol 1988; 11: 44-49.
from thin-layer endometrial cytology: A feasibility study. Acta Cytol 2006;50:63–9. assessing endometrial status in symptomatic Peri and postmenopausal women. Indian J. 23. Khare A et al. Morphological spectrum of endometrium in patients presenting with DUB. People’s journal of scientific research July 2012;5(2):13-16.